MTM Physiotherapy, a well-established brand in the northern suburbs of Perth, recently opened its newest clinic inside the freshly renovated Warwick Stadium. Since opening the doors in February 2016, MTM Physiotherapy Warwick has been delivering high quality physiotherapy services to those who live in and around Warwick in the neighbouring suburbs of Darch, Madeley, Kingsley, Greenwood, Marangaroo, Hamersley, Carine and Duncraig. Conveniently situated on the corner of Wanneroo and Warwick Road and within a 10-minute drive from the Darch region, we are well placed to service your local community. MTM Physiotherapy Warwick are proud to support a number of local sporting clubs including Greenwood Netball Club who as part of the Wanneroo Districts Netball Association play regularly at the Kingsway Sporting Complex located near Darch. 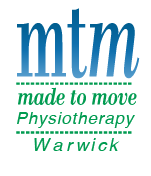 Your experience at MTM Physiotherapy Warwick will include a comprehensive musculoskeletal and functional assessment utilising the gym and court facilities at Warwick Stadium, as well as our treatment rooms. Our physiotherapists will complete a thorough physiotherapy assessment in order to diagnosis and determine the underlying cause of your pain or injury. With exclusive access to the Warwick Workout gym, the team at MTM Warwick will ensure that your rehabilitation will allow you to reach to your full potential and prepare you to return to your favourite sports, hobbies and day to day activities. If you have any questionsplease feel free to give us a call today on 6244 0345 to chat to one of our friendly physiotherapists. Alternatively, you can send us an email at contact@mtmphysiowarwick.com.au.